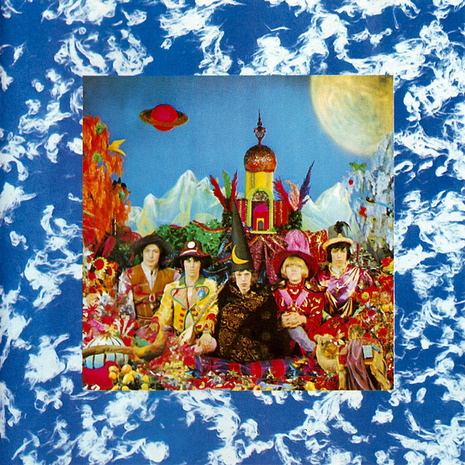 Their Satanic Majesties Request is the sixth studio album by The Rolling Stones and was released on 8 December 1967 by Decca Records in the United Kingdom and the following day in the United States by London Records. Its title is a play on the "Her Britannic Majesty requests and requires..." text that appears inside a British passport. Without a doubt, no Rolling Stones album — and, indeed, very few rock albums from any era — split critical opinion as much as the Rolling Stones' psychedelic outing. Many dismiss the record as sub-Sgt. Pepper posturing; others confess, if only in private, to a fascination with the album's inventive arrangements, which incorporated some African rhythms, Mellotrons, and full orchestration. Never before or since did the Stones take so many chances in the studio. In 1968, the Stones would go back to the basics, and never wander down these paths again, making this all the more of a fascinating anomaly in the group's discography. Begun just after Between the Buttons had been released, the recording of Their Satanic Majesties Request was long and sporadic, broken up by court appearances and jail terms. Starting with this release, non-compilation albums from the band would be released in uniform editions across international markets. Released in December 1967, Their Satanic Majesties Request reached #3 in the UK and #2 in the US (easily going gold), but its commercial performance declined rapidly. It was soon viewed as a pretentious, poorly conceived attempt to outdo The Beatles and Sgt. Pepper's Lonely Hearts Club Band (released June 1967), often explained by drug trials and excesses in contemporary musical fashion, although McCartney and Lennon did provide backing vocals on "Sing This All Together." At this point, the album was the first (and only) album produced by the Stones themselves. The production, in particular, came in for harsh criticism from Jon Landau in the fifth edition of Rolling Stone Magazine, and the Stones turned to Jimmy Miller to produce their subsequent albums. The response of the audience and the growing rejection of the flower power scene by Jagger and Richards would mean a turning point for the Stones: in 1968 the Stones would return to the hard driving blues that earned them fame early in their career. Indeed, admiration and love of the album has grown over the years as a kind of punk rockers' own ragged flipside to the Beatles more cheerful masterpieces from the same period. Songs such as "Citadel" have been covered by a number of young rock bands. Initial releases of the album featured a three-dimensional picture of the band on the cover by photographer Michael Cooper. When viewed in a certain way, the lenticular image shows the band members' faces turning towards each other with the exception of Jagger, whose hands appear crossed in front of him. Looking closely on its cover, one can see the faces of each of the four Beatles. Later editions replaced the glued-on 3-dimensional image with a standard photo, due to high production costs. A limited edition LP version in the 1980s re-printed the original 3D cover design. Immediately following the re-issue, the master materials for re-printing the 3D cover were intentionally destroyed. It was the first of four Stones albums to feature a novelty cover (the others were the zipper on Sticky Fingers, the cut-out faces on Some Girls, and the stickers on Undercover). The maze on the inside cover of the UK and US releases cannot be completed. It has a wall at about a half radius in from the lower left corner. One can never arrive at the "It's Here" in the centre of the maze. The album was released in South Africa as The Stones are Rolling because of the word "Satanic" in the title. There are only two songs from the album which The Rolling Stones performed live, "2000 Light Years from Home" (1989 U.S. Tour and 1990 Tour of Europe), and "She's a Rainbow" (1997-98 Bridges to Babylon Tour). In August 2002, Their Satanic Majesties Request was reissued in a new remastered CD, LP and DSD by ABKCO Records. The song "2,000 Man" has been reworked and covered by Kiss guitarist Ace Frehley for the band's 1979 album, Dynasty. American neo-psychedelic band The Brian Jonestown Massacre paid tribute to the album with their second album Their Satanic Majesties' Second Request. In 1998, a bootleg box set of eight CDs with outtakes of the Satanic sessions was released on the market. The box set shows the band developing the songs, and striking is the cooperation between Brian Jones, Keith Richards and session pianist Nicky Hopkins. Richards is leading the sessions and most songs seem to be written by him, and both Hopkins and Jones indulge in creating elaborate soundscapes. This was the first album by the Stones to get bad reviews. Too bad, it didn't deserve it. No it's not at all your typical Stones album, more a hippie psychedelic album that some felt sounded too much like the Beatles. Pictures of the Fab Four's faces on the album's cover somewhat hidden in the flowers did not help matters. The truth was that this album was made in pieces with Mick Jagger, Keith Richards and Brian Jones in and out of court facing drug charges. Nobody knew who would be in the studio on any given day.